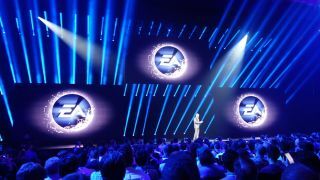 It's all about next-gen games at EA's E3 2013 press conference, which is now a wrap in the Shrine Auditorium in Los Angeles. In a star-studded press conference that saw the likes of Aaron Paul from "Breaking Bad," Dana White of the UFC and b-baller Kyrie Irving tackle the stage, EA trounced out a total of 11 titles, accompanied by a bevy of demos (and a slam poetry session). All titles on deck are destined for consoles- the Xbox One and PS4 - that aren't even on the market yet. While we'll break down some of the games in the coming grafs, we thought we'd do the reverse of EA and skip to the good stuff first, showing a still from Mirrors Edge 2, the follow-up gamers have been gobbling over. The release date is an cheeky "coming...when it's ready." Among the other titles introduced was Star Wars: Battlefront, the shelved LucasArts game that's now in development at DICE with the same folks who concocted Battlefield 4. No word on availability for the anticipated title, but we'll let you know when that information becomes available. Following talk on NBA Live 14 and a new BounceTek feature for enhanced dribbling effects, recording artist Drake took time out from what we're sure is a busy touring schedule to introduce a demo for FIFA 14. But enough about him. FIFA 14 will add "hundreds" of new features that bring the players to life, with a flesh-and-blood crowd experience to give the game some "nothing will compare" flare. Look for it in the fall on the next-gen consoles. Microsoft set the bar pretty high when it elevated a McLaren P1 in a fog of smoke, but "Breaking Bad" bad boy Aaron Paul lent some Hollywood hipness as he baited Need for Speed: Rivals. Paul is starring in a movie based on the franchise and drives the same custom Ford Mustang wheeled onstage. Curious how much the Xbox One will cost? We've got the info for you right here.